These are the type of scars that are depressed, serrated or flat against the upper layer of the skin. Sometimes such type of scarring is considered hyperpigmentation, which is a condition where certain areas of the skin develop darker skin pigmentation compared to other areas. Hyperpigmentation is a skin discolouration that usually fades with the passage of time and proper medicine. Contrary to hyperpigmentation, atrophic scars are caused by tissue damage. Such type of scars are elevated and raised in appearance. As compared to atrophic scars characterised by loss of tissue, hypertrophic scars occur because of the excessive tissue that develops over skin openings caused by infections or wounds. Hypertrophic scars are somewhat similar to keloid scars in their characteristics and appearance; however they form only on the areas of injury. Just like keloids, you can treat hypertrophic scars with silicone sheets and steroids. Keloids form when the healing phase has gone too far and the body has done all the necessary repair beyond the damage. It is essential to note that in various cases, the extent of healing also affects the movement of the affected area. Keloids are often spotted on dark skinned people, as well. It is easy to treat keloids through surgery. They can also be cured through the application of silicone sheets and steroid injections. Minor keloids are often treated by using liquid nitrogen applied on the affected area for quicker fading. Such type of scarring happens when you are burned. The burn is most often present on the joints and creases. Scar contractures tighten the affected skin and may affect your movement and flexibility. These types of scars can make your skin look ruined. If the contracture scarring is deep, then it may also disrupt the normal functioning of your nerves and muscles. Stretch marks are other types of scars that happen mostly to people who have experienced extreme weight loss, as well as obese individuals and pregnant women. The skin tears, particularly on the buttocks, thighs and breast areas when a person grows or shrinks too fast. Acne and pimples usually heal after some period of time, but the marks they leave make some unpleasant scars. Acne scarring is caused as a result of severe acne. 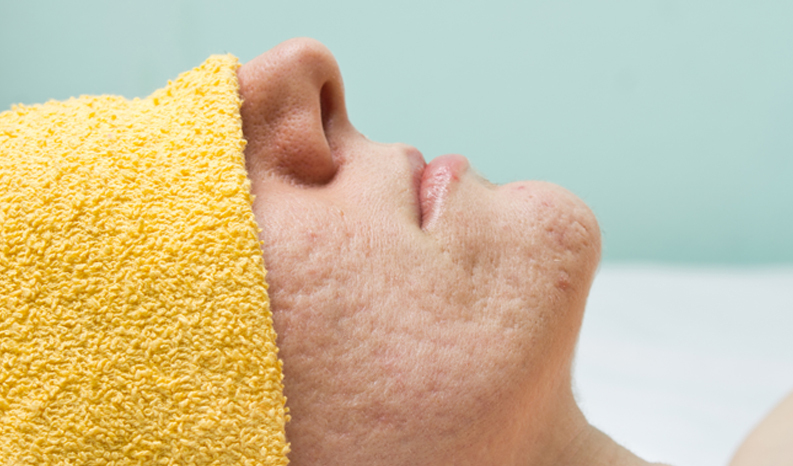 There are various forms of acne scars that differ in their type and depth. Also, the treatment of acne scars is dependent on the type of scars you have. Ice pick scars are pores that are open and large. They are narrow and deep marks that go beyond the uppermost layer of the skin. Ice pick scars are actually pores that form when acne infections reach the skin surface and destruct skin tissue along the way. These are generally found on the areas where the acne tends to break out more frequently. Ice pick scars are atrophic and may also happen when you pick on the blackheads and whiteheads. They can be either soft or hard, and have a tendency to prevail in the cheek area. Boxcar scars are wider than the ice pick scars and are atrophic in nature. They occur after a severe acne breakout and inflammation, which destructs the collagen in the skin. The damage done to the skin tissue causes the pitted appearance of boxcar scarring. Rolling scars are hypertrophic scars that appear wave-like. These scars roll in wide and shallow rows over the skin. When skin infection occurs, the subcutaneous tissue of the skin form fibrous bands of tissue, which tweaks down the outer layer of the skin. Due to this, the epidermis, the naturally smooth surface of the skin, forms grooves that look like they are rolling over the skin.